Milby High School’s library is a place “where learning never ends,” and now, the whole world knows it. 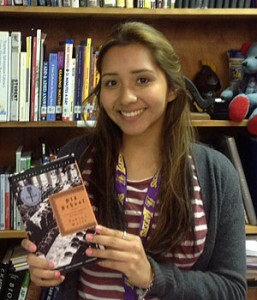 Senior Nancy Casarrubias created a five-minute video showcasing her library (and its librarian, Rowena Verdin) for a digital storytelling contest sponsored by the American Association of School Librarians—and her entry won in the high-school category (grades 9–12). Nancy put together a photo montage set to the 1980’s Tears for Fears hit, “Everybody Wants To Rule the World,” that showcased Verdin’s creative approach to building excitement about reading, including taking pretend “mugshots” of students caught reading controversial literature during Banned Book Week. As a winner, Nancy will receive a set of books signed by Lauren Myracle, the author who judged the high school entries. You can watch her video here. This entry was posted in Achievement/Recognition, District III - Sergio Lira, High Schools, Literacy and tagged Milby HS on May 4, 2015 by HISD Communications. Great Job Nancy! Keep up the great and hard work. Your dedication to education is inspiring.